Flow restricted hydraulic fittings allow increased control over the speed that the wings go up and down to reduce the risk of damage. We manufacture our own industrial cylinders with induction hardened chrome shafting, urethane seals and wear bands to eliminate scarring and oil contamination. Shorter strokes translate into rapid movements and more wear, so we developed our center cylinder with a longer, smoother stroke to increase life expectancy and reduce wear and tear. Vibration. The largest single contributor to metal fatigue, stress-cracking and structural failures. 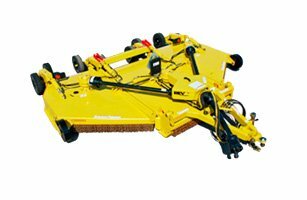 In the design of our rotary cutter we've integrated a series of vibration dampening systems that collectively absorb the vibrations.